THE WORLD WAS CRAZY fifty years ago. In Paris university students rioted in May 1968. And by the end of the month 11-million French citizens also took to the streets, pushing the government to the brink of collapse. As well in 1968, The Prague Spring tested patience in Czechoslovakia, before tanks rolled into the Soviet bloc country and terminated student demands for change. And throughout the United States, as America’s involvement in the civil war in Vietnam grew, student protests large and small were popping up everywhere; a police riot at the Democratic National Convention in Chicago exemplified the chaos in the nation, as other breakdowns in law & order unfolded in Washington, Baltimore, Kansas City, Louisville… Even in sleepy Canada, at what today is Concordia University in Montreal, the largest student protest in our country’s history concluded with 2-million dollars damage to the institution’s mainframe computers. Leaders of the world in 1968 were alarmed and perplexed; they didn’t understand why students—many coming from privileged backgrounds, the so-called best & brightest—challenged the authority of their governments. They wanted to know what could be done to quell future unrest (more on this in a moment). Madeline Albright is the first woman in US history to hold the office of Secretary of State. Serving during the second term of the Clinton administration, she travelled the world as America’s emissary. Her tenure followed the 1991 collapse of the Soviet Union, a time when most agreed democracy and capitalism had won the day. And that was that. But in her book, Fascism, a best-seller, Albright argues that democracy today is very much in peril; an argument echoed in Benjamin Carter Hett’s new book, The Death of Democracy, a disturbing account of how Adolf Hitler democratically came to power. You can also hear in Barack Obama’s speeches how chaos in the world creates the conditions for ‘strongman politics’ and democracy’s demise. Samuel Huntington is an American political scientist best known for his theory on the Clash of Civilizations. In a post-Cold War world, he reasoned that future skirmishes would no longer be waged between countries, but rather between cultures and religions (most notably between Islam and Christianity). At the time of publication, his political theory seemed out of step, but the events of 2001 confirmed Huntington was prescient. What’s not as well known is Huntington’s contribution to a Trilateral Commission report that answered the question on the minds of leadership and government in the aftermath of 1968. His essay was called The Crisis of Democracy in America, Europe and Japan. And the crisis of democracy, Huntington said, is there’s too much of it. Students in 1968 learned quite a bit more than previous generations did at school. And they expected more from their governments. So what to do? The solution reads like Machiavelli’s recommendations in The Prince. Huntington’s advice: “balance [needs] to be restored between governmental activity and governmental authority.” And one sure-fire way to calm 1968-style democracy surges in the future is to constrain information; the less people know, the less they can demand. EGGS & BACON OR BACON & EGGS? Elections are coming to Alberta in 2019. A provincial spring election, and in the fall, voters will also elect a new federal government. In a global environment where democracy seems to be withering, and information constrained by either/or narratives, how can Albertans make an informed decision about who or what to vote for? The answer is in our history. Fifty years ago, a political phenomena swept Alberta. 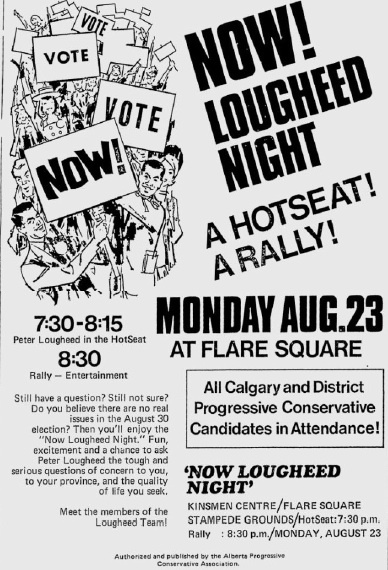 Peter Lougheed & his team of ‘progressive’ conservatives declared NOW! was the time for change. What was once an unremarkable place, by 1971, became an attractive destination for people from all over the country and the world. It was an exciting time in Alberta. And I think it can happen again. Don Hill and I have been interviewing people on Lougheed’s Team. We think too much information is not the problem; the challenge is what to do with information once you are informed. Give a listen to this excerpt from a conversation about PETER’S PRINCIPLES. We believe Albertans can hold the current political leadership—no matter the party flavour—to a high standard of public service. We deserve no less. We’ll be sharing insights from our many conversations. Keep returning to this space to learn more about Lougheed’s leadership practices; how they worked and what might be relevant—fifty years from now.